Our original plan was to book a beach house in Tali, but unfortunately, almost all of them were already booked and those that were available can't accommodate 40+ people. I kind of expected it na because we planned too late. We finalized the date less than 2 weeks before the target. Since it was kinda last minute and they wanted a place that has a pool & a beach, I suggested Bernabeach. It was the nearest, most accessible, and could accommodate all of us. Barangay naman kasi kami sa dami. Haha. I called up the resort and asked for the available rooms for April 10. Most of them were Standard Rooms nalang (good for 2) and a few Kubos (nipa huts). I wanted the "Barangay Room" sana because it could accommodate 15 people, but naunahan kami. Sayang. Achie, my cousin, took care of the car & room assignments + the meal planning which her mom, Tita Masang, would cook. RJ & Ate Tricia took care of collection & payment. For the food, we agreed on Adobo (because it doesn't spoil easily), Binagoongan, Liempo & Grilled Eggplant (easy to cook) and hotdog & eggs for breakfast. Left at around 8am but arrived after lunch na because it was super traffic going there! Buong sambayanang Pilipino ata nag outing din. Haha. When we got there, some were already in their rooms including my Mom and my Tita Connie. My sis, Miles, Nico and I were supposed to stay in their Kubo for 4 but my Mom insisted that we avail nalang aircon rooms. So we did. We cancelled 2 kubos (immediately rented by other guests) because some of my cousins also backed out from the trip. We booked 8 airconditioned Standard Rooms (P2,200 each, no need to pay entrance fee), 1 Kubo for 6 (P2k + P200 entrance fee each), 1 Family Room for 3 (P3,500) and some of us stayed in tents. No charge for tents, you just need to pay P200 entrance fee. The receptionists were helpful (not that friendly & nice though, hope they could improve on this) but they wanted us to pay the balance immediately. I asked if we could just pay when we're all complete (some of my family members were not yet there by that time) or upon check-out, but they said they need it settled agad. I said okay and told them I'll just collect the payments, but didn't come back na. Haha! It was so hard to collect kasi especially when we're still trying to settle, prepare our things, prepare the food, etc. Db? They kept on calling me the whole day to ask for the payment. They only stopped when my Mom talked to the manager and discussed with her the issue. She was kind enough to agree naman. Thank you Madame Manager! :) We can finally chill and enjoy our day. Haha. Now, let me tour you around! Beach area. Can you see the gate going inside the resort? Rented white tent on the left which served as our dining area. While taking photos, a bangkero or boat man approached us asking if we wanted to go island hopping. It was late na that time, so we got his number and told him we'd do the activity in the morning. Boat rental was P1,500. Not as clean as before:( Can you see those white spots? Those are garbage. Arrrgh. I did not go swimming this time. Pool was jampacked. There was a company outing that day. Malas. Hehe. We were supposed to sleep sa Kubo for 4 which was only P1,500 but no aircon. Naawa ata my Mom so she sponsored half of our new rooms. Haha. Standard Room is P2,200. Kubo for 6 (P2,000 + P200 entrance fee each) where some of my cousins stayed! Time for a quick OOTD! Love my new Veloci watch! All black! Yipee. They already have more kubos and more picnic tables & benches inside. This area was bare, except for a few tables, back in 2014. They even have this snacks & drinks bar now. Don't order their siomai. It was meh. Shake & halo-halo were okay. I saw another pool being constructed behind one of the kubos. Nice! Nico bonding with my niece Mickey! She's his favorite. Hihi. Baby Gelo after showing him the video of Katy Perry's "Roar" and singing along with it. Knock out! Haha. Family dinner inside! Near the basketball court. They lock the gate going to the beach by 7pm. Nagmomoment kami ni Nico sa pool haha! After dinner, my cousins and I wanted to bond some more so we took a dip in the pool (less people now) while drinking beer. There was a live band who played that night and my cousin Rj jammed pa with them. They stopped playing at around 11:30 pm. It was the first time I was able to avail the pool since it was super crowded that afternoon. It was refreshing! Too bad some Kuya asked us to vacate the pool by 12 midnight because they were gonna put chlorine and clean it daw. Sayang. We left the pool and decided to drink nalang at the picnic tables and benches area near the gate. It's weird though because on my way back to our room, I still saw a few people swimming. Also, no one cleaned the pool naman. Maybe the staff fell asleep. Haha. Woke up early the next day to go island hopping. Almost everyone came with us! Even our Titos and Titas. More, more fun! Our boatman had to call for backup 'coz we cant fit in 1 boat. Hehe. Our destination -- Bamboo Beach! This white sand beach is 650 meters long but 80% privately owned. Only 20% is open to the public. 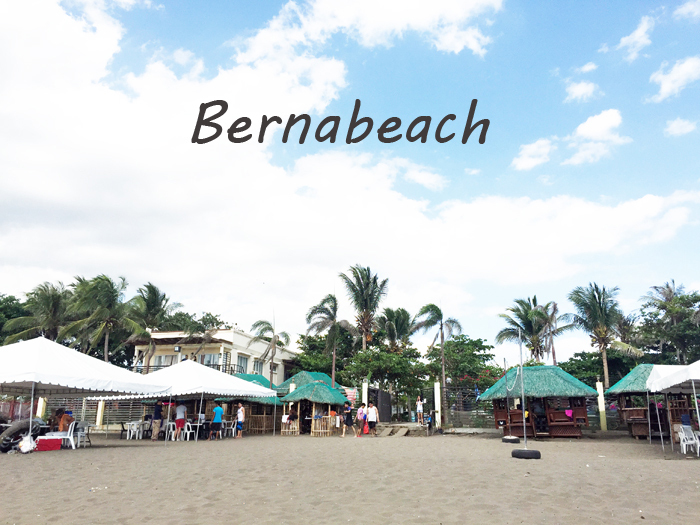 It's known to be one of the best beaches in Batangas. You would see the very private Kawayon Cove here. My cousin tried to take a photo in front of their fence but the guard shooed him away. Hahaha! Magkano ba yan??? Mapag ipunan nga. Charot. Sea bed was quite rocky, so good thing I was wearing my TEVA! We only had less than 2 hours in the island, so we decided to check out agad the cliff diving site. From the shore, we had to walk where the rocks are and climb a little. Took us 5-10 mins to get there. Wore my Teva sandals, Veloci watch & Sassa swimsuit! Rocks were quite sharp, so my sandals came in handy! I must work-out stat! Haha. D rin nakatulong pagka constipated ko. Huhu. Nico trying to summon all his courage. Haha! Na-solo din namin sa wakas! Brought these L'oreal Revitalift products for me and my mom! Third wheel daw si Kikoy. Haha! Ayaw namin ng stripes noh? Aura muna while waiting for 4pm. Just to satisfy our cheese bread cravings! So sad that the beaches nowadays are always littered by those irresponsible "tourists". Grabe! Dapat kung anong itsura mo siya nadatnan ganun mo din iwanan. Kainis, tapos magrereklamo bat mainit, bat may baha? Hi, do you still have the number of the boat you rented? Thanks!